Secretary of Defense James Mattis on Tuesday dismissed allegations in Bob Woodward’s book Fear: Trump in the White House, which he called "fiction." Mattis said the upcoming book is an example of "a uniquely Washington brand of literature" and denied the criticisms of President Donald Trump that Woodward attributes to him. 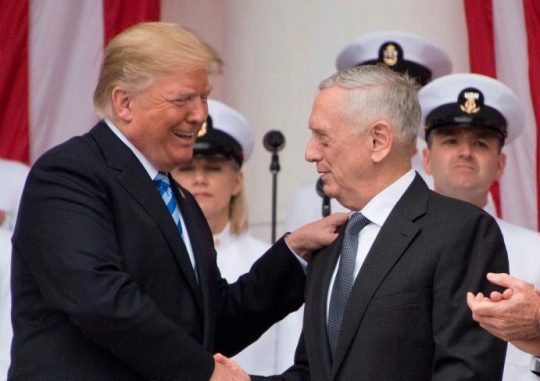 "The contemptuous words about the president attributed to me in Woodward’s book were never uttered by me or in my presence," Mattis said in a statement. "While I generally enjoy reading fiction, this is a uniquely Washington brand of literature, and his anonymous sources do not lend credibility." Mattis defended the administration by pointing out how effectively they have worked together to serve American interests and achieve key goals. He admitted their cooperation can be "messy" but said debate has not led to enmity. "While responsible policy making in the real world is inherently messy, it is also essential that we challenge every assumption to find the best option," Mattis said. "I embrace such debate and the open competition of ideas." "In just over a year, these robust discussions and deliberations have yielded significant results, including the near annihilation of the ISIS caliphate, unprecedented burden sharing by our NATO allies, the repatriation of U.S. service member remains from North Korea, and the improved readiness of our armed forces," he added. "Our defense politics have also enjoyed overwhelming bipartisan support in Congress." He also said the idea he would insult Trump or tolerate such behavior at the Department of Defense is "a product of someone's rich imagination." Woodward’s book includes the claim that Mattis said Trump’s understanding of North Korea was that of a "fifth or sixth grader." This entry was posted in Politics and tagged Bob Woodward, Department of Defense, James Mattis, Trump Administration. Bookmark the permalink.